Elegant, versatile, and durable as it is, marble, like any other surface, needs conditioning, cleaning, care, and maintenance to preserve its beauty and prolong its life. 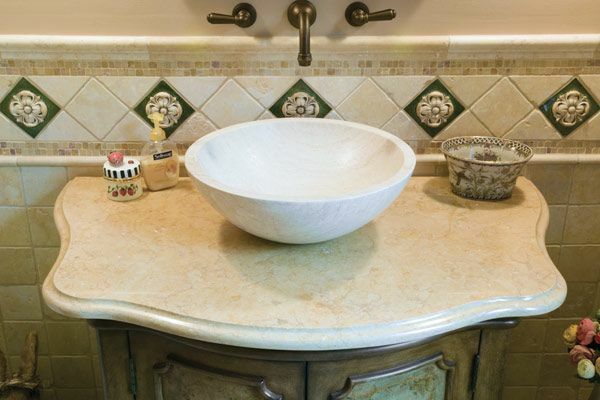 Because it is absorbent, marble countertops and vanities need special care. Marble can stain with spillages like liquids or oil, and is sensitive to acids like citrus juices, vinegar, or household cleaning chemicals, which can damage its surface. When used externally, it is vulnerable to acid rain or pollutants in the atmosphere, which erodes and discolor its surface. Neverthless, taking care of your marble as soon as you install it will go a long way to preserve it and save restoration costs in the long run. Use honed marble on the floor, as it is more resistant to scratches. 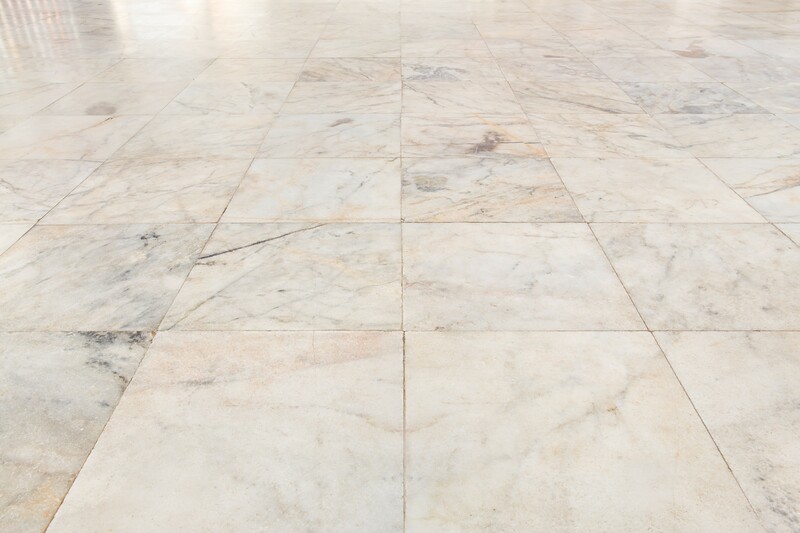 Avoid using polished marble in high traffic areas. Placing non-slip mats or rugs at the entrance minimizes soiling from dirt on shoes. Wipe anything that spills on marble immediately. Use coasters under glasses or bottles. Use mats or trivets to place hot items on marble. Follow a daily and periodic cleaning routine. Use clean mops and brooms. Old vacuum cleaners will scratch your marble, avoid using them. Change mopping water frequently during cleaning. Always rinse using clean, warm water. Allow floors to dry before use. Always follow the directions on your cleaner and avoid mixing chemicals unless specified. Use abrasives (nutshells, feldspar or silica, quartz etc) on honed marble only, and never on polished surfaces. Abrasives can cause scratches. Avoid using chemical cleaners, acids like vinegar and lime juice, grout cleaners, tub or tile cleaners on marble. They will etch or dull the stone. Try not to use wax on marble, as it can make it slippery and therefore a hazard for people in socks. Inspect interior and exterior tiles regularly and correct flaws straightaway. Never use a mixture of ammonia and bleach for removing stains. The resulting gas is toxic and lethal. Do not use hot water to clean spilled milk or blood, as doing so makes the stain worse. For best results, please do not use acid based household cleaners on your marble. Soapless cleaners and other neutral cleaners like specialized stone soaps are ideal, as they do not damage the surface. Mild phosphate-free, eco-friendly dishwashing liquids or powders, suitable detergents (PH 7 –neither acidic nor alkaline), or vegetable oil based soaps are also fine, as long as you rinse the soap off completely. Contact your stone dealer for more details or head to MrStone.com who offers a wide variety of save and effective stone cleaner and maintenance products. Sweep using a soft brush for polished surfaces, and medium bristles for a textured surface. You can also vacuum, as long as the vacuum is in good condition as worn out vacuums can harm stone floors. Additionally, dry mopping with a non-treated cloth is another effective and safe way to keep your floors pristine. Ideally, granite is best as a kitchen countertop because it is very hygienic and easy to clean. It's also among one of the most durable natural stones. If you decide on marble, however, then honed (natural finish with no shine) is best, as it is easier to manage. You can scrub your honed marble counter using abrasives, bleach, and soaps with a scouring pad without worrying about damage. Rinse well and dry afterward using a soft cloth. Honed marble also is less likely to show etching as clearly as polished marble. Remove excess water immediately using a squeegee. Hard water is particularly damaging to stone, so clean up using a neutral soap scum powder or a solution of half a cup of ammonia in one gallon of water once a month or so. Use mild bleach in clear water in hot tubs to remove algae or moss. Keep steps, paths, walkways, and garden ornaments free from dirt by sweeping and washing often. Ultimately, that's the major trade off when doing marble applications outside. You're going to need to be on top of routine maintenance such as sealing and cleaning. Now if you do keep up with the daily chores, your steps and walkways will be the envy of the neighborhood, especially those with the cheap plastic fencing and porches. I want to buy a table from a nationwide furniture store chain that has a marble top. Is there some way to seal it to prevent stain problems? Maggie, Please visit http://www.mrstone.com/stone-care-products.html for industry standard stone maintenance products. In order to apply sealant correctly the surface has to be completely clean and free from any oils and dirt. I would recommend cleaning it with a natural stone cleaner to prep the surface. Some experts believe acetone will be sufficient, however, it may etch the marble.